Easton, MD – When Brian Riddle sought to create a new line of starter plants at his two Homestead Gardens stores in Anne Arundel county, he thought he had come up with the perfect name. “Chesapeake Harvest,” he believed, would resonate with his clientele of home gardeners who prefer to shop locally, and who have a strong connection to the Chesapeake Bay watershed. The only trouble was, the name was already in use. The Easton Economic Development Corporation (EEDC) established Chesapeake Harvest in 2014 to support a vibrant food economy on the Eastern Shore. The program assists local food producers–both agriculture and aquaculture–with marketing and branding, technical issues, and pathways to expanded wholesale and retail markets across the region. Instead of seeing a conflict, Riddle saw an opportunity. He contacted the EEDC and a partnership was born. Thanks to a licensing agreement, Riddle, working with Tidal Creek Growers and Easton’s Chesapeake Harvest, will carry a line of Chesapeake Harvest-brand starter plants this season. “The Chesapeake Harvest message aligns with what we know our customers are looking for,” says Riddle. 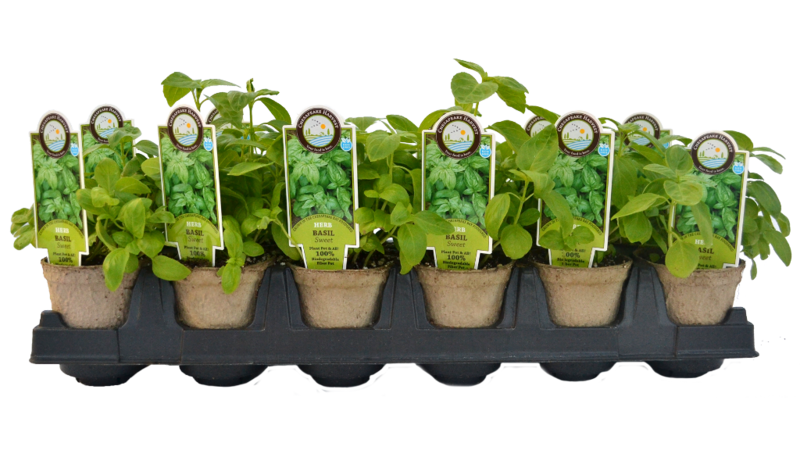 This spring and summer, Homestead’s plants for gardeners – including basil, parsley, lavender, tomatoes, peppers and many more – will be packaged in a new line of biodegradable pots and will bear a tag with the Chesapeake Harvest logo. A portion of proceeds from each sale will go towards helping Chesapeake Harvest fulfill its mission. At the same time, the branding of tens of thousands of plants will help promote Maryland’s farming economy, and the new starter plant products will appeal to Homestead’s eco-conscious customers. Tidal Creek Growers, which grows Homestead’s plants at its greenhouses in Davidsonville, has a one-year licensing agreement to use the Chesapeake Harvest name. The new line will include Tidal Creek’s 50 most popular garden varieties, with projected sales of more than 20,000 plants in 2018. If the products are a success, Mike Leubecker,Tidal Creek manager, says he hopes to expand beyond the initial varieties while introducing the new brand to other stores up and down the eastern seaboard. This could mean that the Chesapeake Harvest name will reach hundreds of thousands of consumers each year. Riddle says the new agreement fits with the mission of his family-owned Homestead Gardens. “I’m very committed to supporting local agricultural efforts,” he says. “The opportunity to partner with organizations like Chesapeake Harvest is what Homestead Gardens is all about.” Riddle says he hopes to work on other branded products with Chesapeake Harvest that will further promote and support its mission. Chesapeake Harvest, a Maryland limited-liability benefit corporation, is an initiative of the Easton Economic Development Corporation to invest in branding, sales, marketing and technical assistance to enable Eastern Shore farmers to expand market reach, increase the supply of local, healthy foods to the region, and support employment opportunities in agriculture and aquaculture..